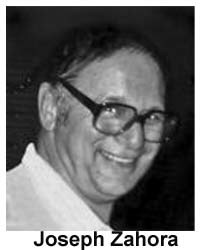 Joseph J. Zahora, 84, of Coaldale, passed away on Saturday, July 28, in DeLand, Fla., resulting from progressive supranuclear palsy (PSP). He spent most of his life in Cape May, N.J., with his wife, the late Ann (Jones) Zahora of Lansford, who passed away in 1997. He was president of the Class of 1946 of the former Coaldale High School. 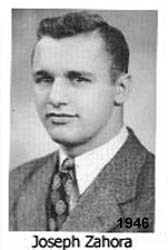 Zahora served in the U.S. Army in Japan after World War II.He was a fullback and punter at Penn State and later graduated from Bloomsburg State Teacher's College. He taught general science and math at Cape May High School, Lower Cape May Regional High School (where he also coached football and track) and the Teitleman School. He loved to cook and experiment with recipes and enjoyed chicken paprikash, stuffed cabbage and other meals from his childhood. He was a big fan of the Eagles, Phillies and Nittany Lions. Most of all, he loved his wife and family. He sang and smiled a lot, keeping a positive attitude even through 13 years with PSP. Born in Coaldale, he was a son of the late Joseph and Julia Zahora, who came from Slovakia in 1911. Children and their spouses are Joseph and Diane Zahora (Roosevelt, N.J.), Gary and Cheryl Zahora (Deland), Gregg and Judy Zahora (Pottstown, Pa.), Joanne and Brian Weyand (Cape May Courthouse, N.J.) and Sallie and Gary Rousseau (Villas, N.J.). He was blessed with 10 grandchildren: Christianne Montoya, Marie Sparks, David Rousseau, Michael and Samantha Weyand, Joseph and Rebecca Zahora and Gregory, Matthew and Sarah Zahora; four great-grandchildren; a nephew, Charly Davison (Andreas, Pa.); and many other nieces and nephews. Tony Zahora (Tamaqua) is his surviving brother. Joe was a lector for many years and a member of the Knights of Columbus at Our Lady Star of the Sea Catholic Church, Cape May. Service: Memorial service 1 p.m. Friday, Aug. 10, Our Lady Star of the Sea Catholic Church, 520 Lafayette St., Cape May. Flowers may be sent to the church or a donation may be made to the Cape May Knights of Columbus, c/o the church, 08204-1487.